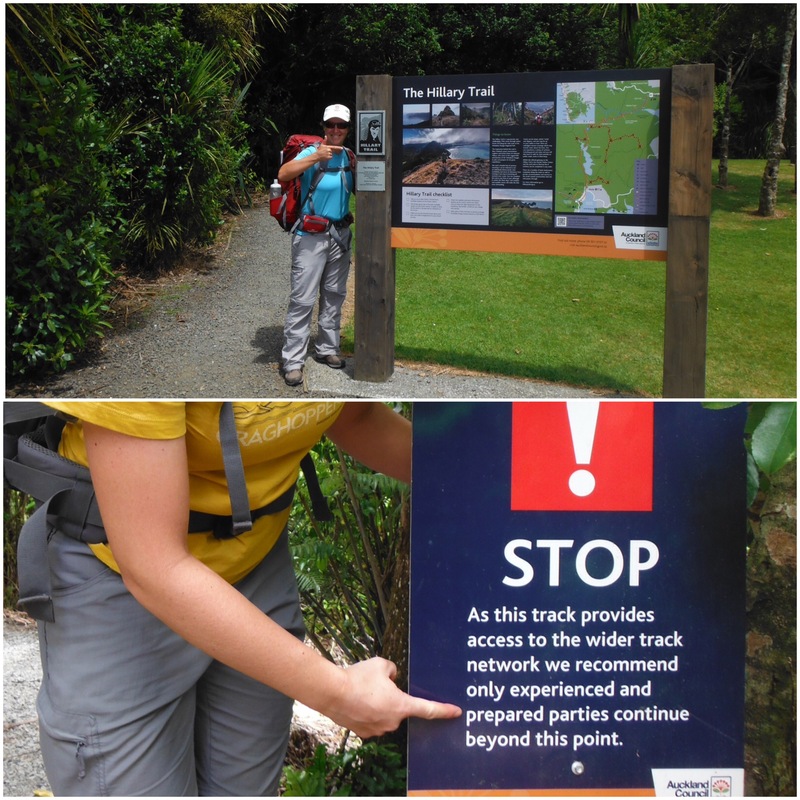 There are plenty of well known walks (tramps to use the local term) in New Zealand and we were keen to do at least one overnight hike whilst here. 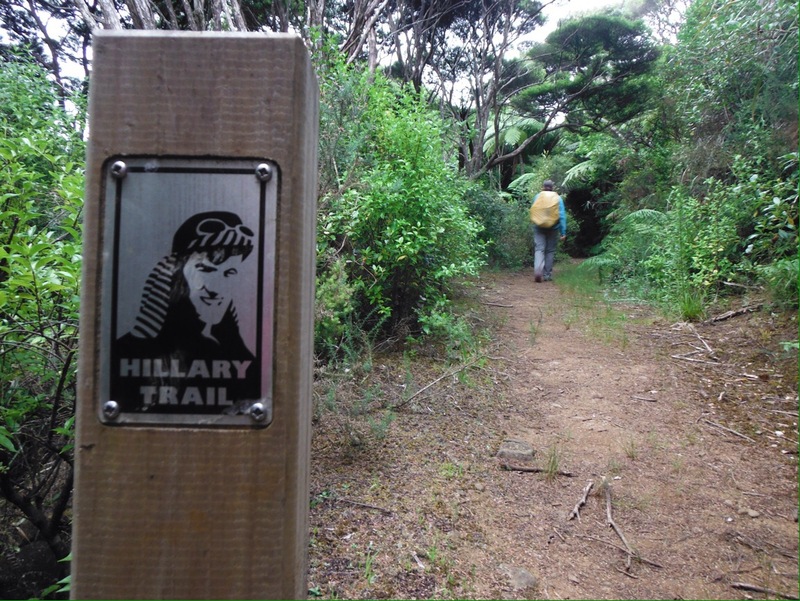 Based in Auckland over Christmas and New Year, the 77km Hillary Trail (named for Everest climbing kiwi Edmund) in the Waitakere ranges west of the city seemed a good pick. Translation: you can do this is four days if you would like to walk 27km on the last day, with only one water source on route, finishing at a beach ‘town’ where there is no public transport at all. Consider an alternative earlier finish point. Do not prepare by participating in Christmas, a well known festival involving much chocolate and little exercise. Pretty sure that one silver D of E between two counts as experienced? If you have been lucky and avoided rain for the first few days by having extremely hot weather, on day four it will piss down while you are waiting for your lift. Make sure you are able to construct a shelter in the car park using your tent groundsheet, a fence and a hair bobble. It’s been a dry summer in Auckland. Apart from this day. All tracks will be like this or made from really sharp stones that you can feel through the soles of your trainers if you complete the walk in the one pair of shoes you have been wearing for the last fifteen months. (See also below). 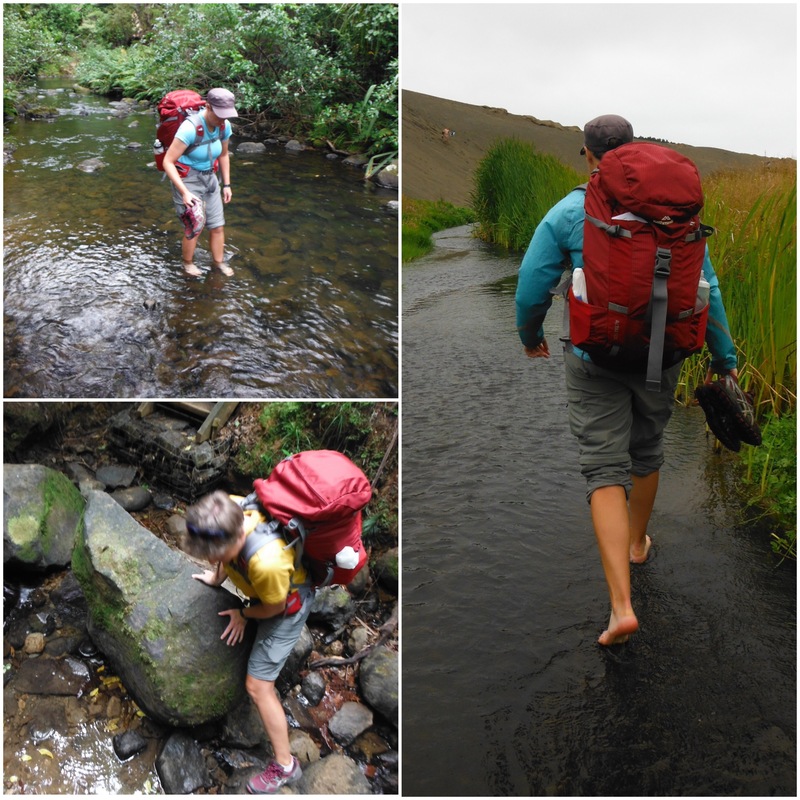 Some stream crossings may in fact just be streams, so take off your shoes and socks and roll up your trousers. In some areas the track might actually be a stream for up to one kilometre. Don’t bother trying to stay dry. It’s about to rain anyway. Top Left: Got to knee deep. Bottom Left: Scrambling to cross a waterfall. Right: The track is a stream, Lake Wainamu. 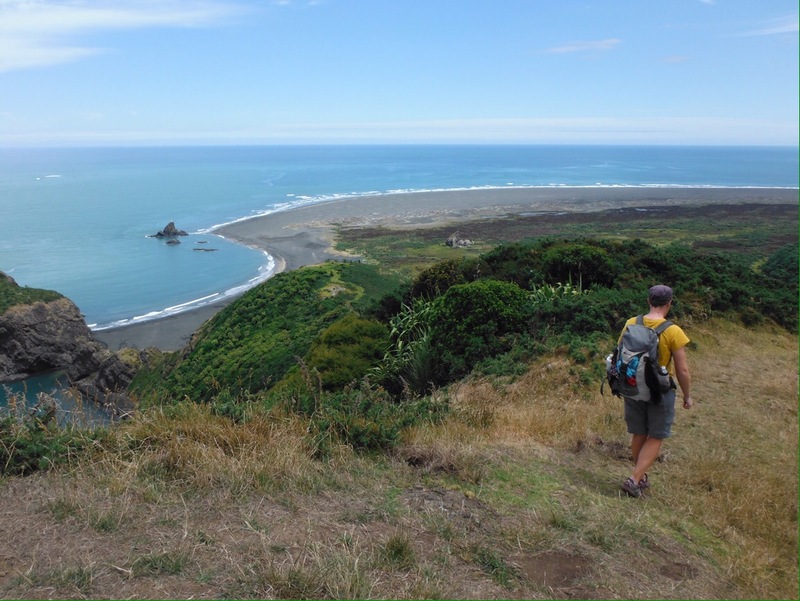 OR you can pack three days worth of food and eat four pies between two when you get to Piha. (Important to try all the flavours: winner Chicken Balti). 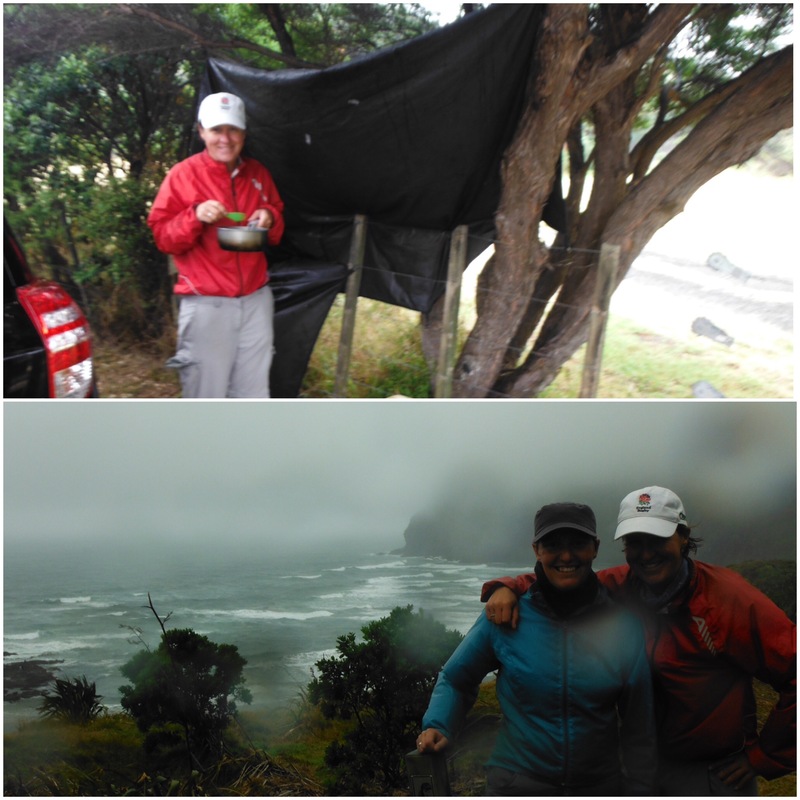 We packed super light and given the limited/very expensive supplies at Piha had a bit of a small lunch on the last day. We carried the day pack that is usually strapped to Jo’s bike and a borrowed 50L pack, swapping bags about every twenty minutes. We did squeeze in a couple of luxury items for New Year – a mini Brie and a couple of servings of baileys in a medicine bottle. 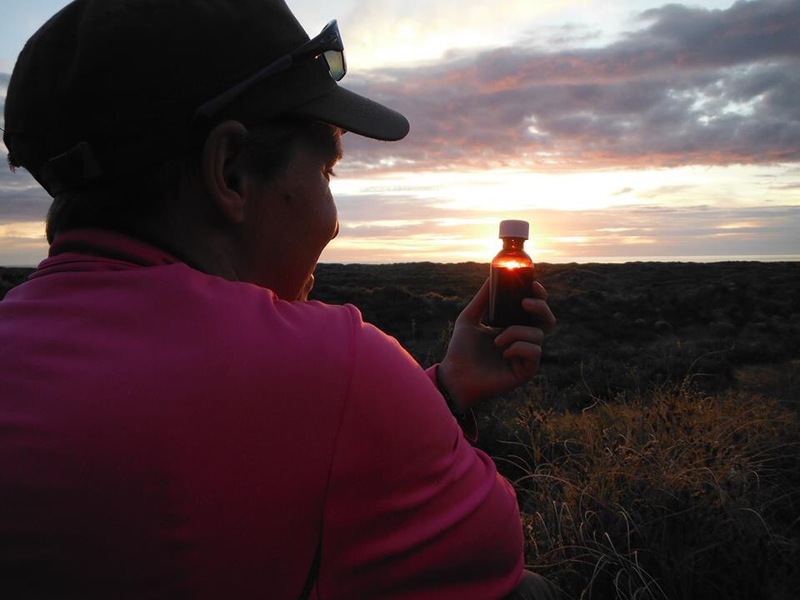 Campsites are basic, water needs treating before drinking, long drops only and showers are the al fresco kind – wash in a stream or the sea. 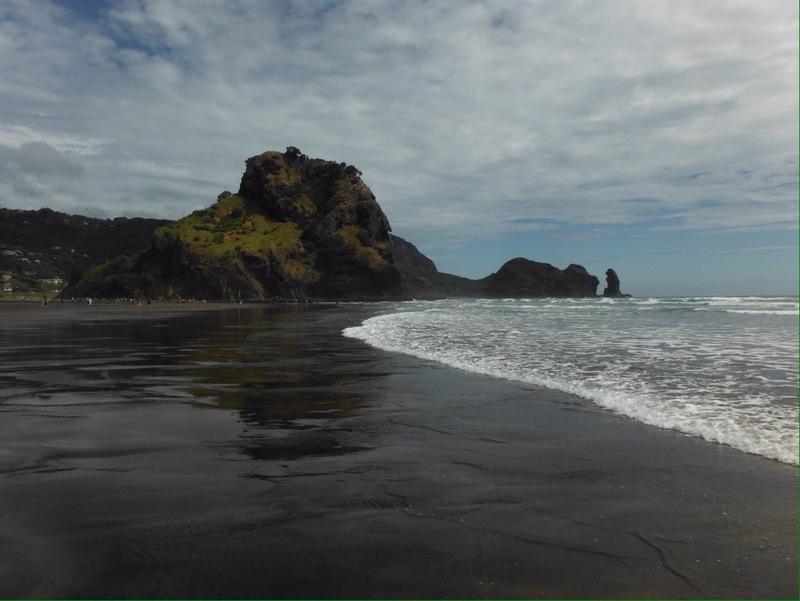 Piha. Translates from the original as ‘Baywatch with Pies.’ The black sand burned our feet. We were surprised that despite doing very little walking, our base cycling fitness was of huge benefit. We didn’t feel wiped out at the end of each day, and weren’t particularly sore or stiff in the mornings. So we did really enjoy it. The scenery was fantastic and it was a satisfying physical challenge, just like bike touring. There were a other hikers that were moving the campground with interesting gaits by day four though. The main difference between walking and cycling is that there is no coasting time when you walk. At least if you ride up a big hill, you get to zoom down the other side. On foot, the downhill seems even more leg damaging. The closest thing to freewheeling is a flat grassy track. I think there was about 400m like this on the Hillary Trail. Approx 0.5% of the trail was as flat as this. 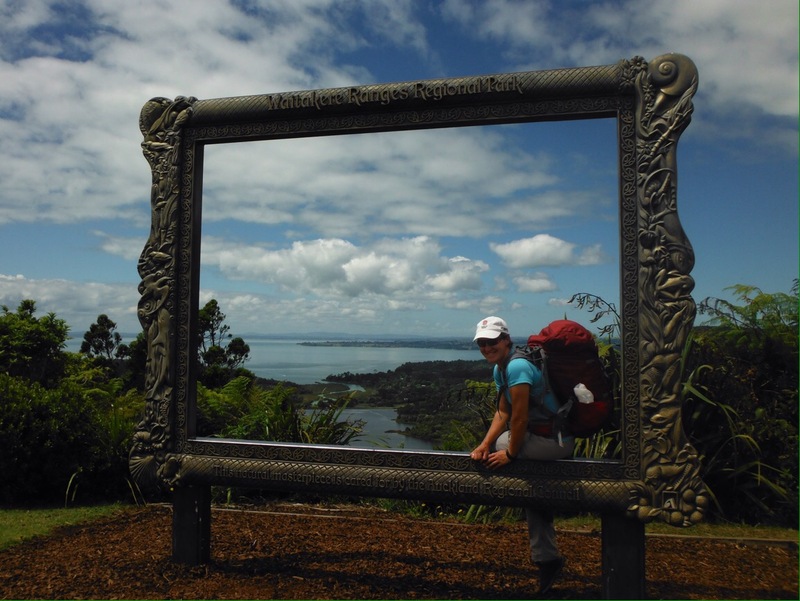 Despite being only about 30km from Auckland, the Waitakeres feel properly wild. A lot of the walk is in dense rainforest, and it’s dark enough at night to see the Milky Way. In terms of family participation, if you can answer yes to the question “Are you the Incredibles?” feel free to go ahead. If not, give some very serious thought to the length of the days, the uneven nature of the tracks and the amount of food/water you need to carry. We had a great time. The scenery made the sweating more than worth it. We loved the self sufficiency of carrying everything we needed on our backs, even if squeezing water through the filter bags did get a bit old by day three. We were pleased and surprised that our wicketkeeping and hockey knees held up to the descents and there were no lasting injuries, not even a blister. It was awesome and we will be looking for other multi day trips in the future. Thanks to: Val for bringing much neeed sandwiches to the pick-up point. The English people that donated some spicy noodles to our baked bean dinner on the last night. Ps. If you’re reading this HRH, Jo didn’t get to do D of E at school, it would great if you could pop a badge in the post for her.